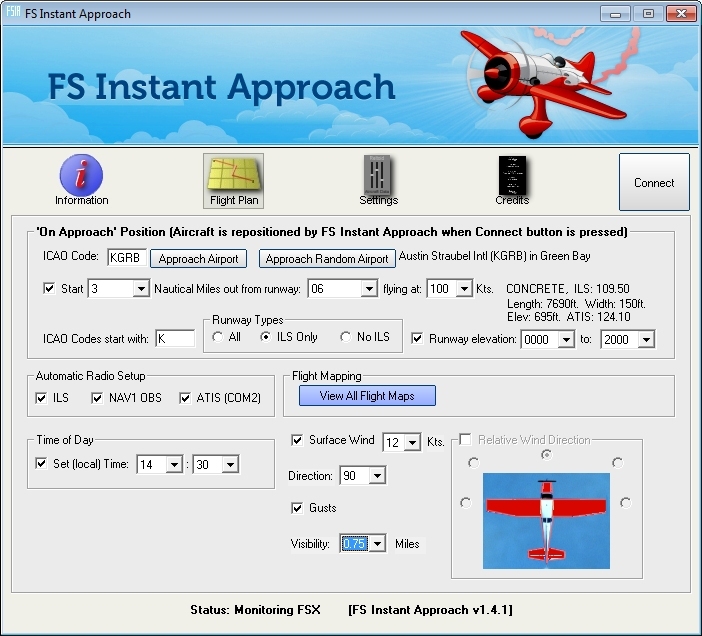 FS Instant Approach gives you the opportunity to instantly practice approaches and landings at any runway in the world! Enter the code of the airport at which you wish to practice a landing, for example, KGRB (Green Bay) or KORD (Chicago). The registered version of the program allows any airport in the world, for example, EGLL (London Heathrow) or KLAX (Los Angeles). Press this button to find the runway in the FS Instant Approach runway data and set it as your approach airport. Press this button to select a random runway - anywhere in the world - and set it as your approach airport. Note that the runway information is displayed when the button is pressed. You may wish to press again for a different runway if the runway randomly selected is unsuitable for your aircraft (for example - it is too short for your airliner!). Check this box so that FS Instant Approach will put you on approach to your chosen runway when you press Connect. Use these two boxes to enter the distance you want to start from and the runway that you wish to land at. Choose the speed at which you would like to start the approach. (Note this feature is not available for FS2004). If you wish to restrict randomly chosen airports so that they begin with a preferred letter or letters, you can enter the letters here. For example, enter "K" if you want codes that start with "K" such as KLAX (Los Angeles Intl) and KJFK (Kennedy Intl), or "EG" for airports such as EGLL (Heathrow) and EGLC (London City). You can filter randomly chosen runways so that they must have an Instrument Landing System (ILS), or they must not have ILS, or you can include all runways without regard to ILS being present. Random airports can also be filtered by elevation. Check this box if you want to specify the minimum or maximum elevation in feet of the airports to include in random selection. Note - if you want no minimum then leave the selection blank - do not set it to "0000" as that will exclude runways which are below mean sea level. Likewise, if you want no upper limit, leave that selection blank. You can set the surface wind at the approach runway. Check this box to set the surface layer wind - note that the altitude of the upper limit of the surface layer is controlled within FSX. If you change the wind using this control and want to go back to what it was originally, you need to set it to something else here. It will not 'reset' to its previous value of this is left blank. Set the surface wind speed here. Note that this speed is used regardless of whether the pilot chooses to set the wind direction in degrees or by choosing the relative wind direction option. The speed applies to either method. You can either set the wind direction in degrees OR you can set the wind direction relative to the aircraft's heading when the approach starts. For the latter, use Relative Wind Direction. This sets the surface wind relative to the aircraft as it starts the approach. Check this box to turn on surface wind gusts. Use with caution - the gusts can be very challenging and their strength increases in proportion to the wind speed. Use this control to set the visibility for your approach. Note that this does not change the overall weather and so it is possible to have very low visibility on what Flight Simulator otherwise describes as a clear day. Think of low visibility set this way as being haze, mist or fog. Get some handy help with those radios! Automatically tunes NAV1 (Navigation Radio One) to ILS (Instrument Landing System) at destination runway (if it is available there). Things can get busy - this can be very useful. Automatically sets navigation radio (NAV1) OBS (omni-bearing selector) to heading of destination runway. Depending on your aircraft's equipment, this can help you with your approach. Automatically tunes COM2 (Communications Radio Two) to ATIS (Automatic Terminal Information Service) at destination airport. Handy to save time and COM2 will not interfere with ATC communications. Remember that to hear COM2 you must press the button on your aircraft's radio which broadcasts the audio from COM2. Practice day, night, dawn and dusk! 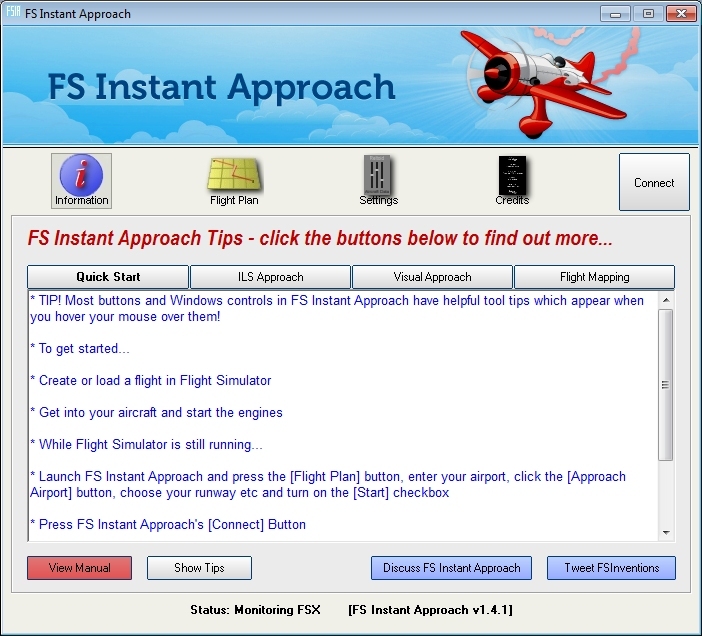 If you want to practise approaches at a particular simulated time of day, you can turn on this checkbox and enter the time of day here so FS Instant Approach will set it when you connect to Flight Simulator. Note that you must first select an airport for your approach. Note also that this is local time, not Zulu (UTC) time. The amount of daylight will obviously also depend on the simulated date and your runway's latitude. Save and map all your flights with Google Maps. You can even share them with any friend with a PC, tablet or smart phone (using the device's web browser). Now you can do all of this with FS Instant Approach's Flight Mapping feature! In order to share a map - just copy the URL in the browser's web address field at the top of the screen and email them the address. This button will open a browser which lists all the Flight Maps you have logged with FS Instant Approach. You can review them at your leisure!